A Powder Room is arguably one of the most popular rooms in a home. It’s convenient to the family room, so the family uses it often; most guests need to use the restroom at least once while visiting; and even those unsuspecting visitors, i.e. : Craigslist purchasers or door-to-door sales students may ask to use the powder room. Yikes! You know that saying… you-can-tell-how-nice-a-restaurant-kitchen-is-by-how-the-bathroom-looks… well, I think that holds true for our homes. A powder room can make a big impression on guests who have a moment of silence to do their business in beauty and comfort (or the opposite). The powder room is an opportunity to show visitors they are in a well-cared for and thoughtfully designed home. Even though I’m giving reasons why it’s important to design a powder room well, I still don’t like spending tons of money in that tiny space. Do you feel me? It’s painful to spend 2k on tile that my boys’ urine will spill on when I could use that money for the most beautiful and comfortable textiles and decor to make our master bedroom a retreat, or [insert 20 other home project wishes]. The previous homeowners raised their 3 boys in this house and there are signs of that everywhere :). As a fellow boy-mom, I get it. They are rough, and they can’t aim. 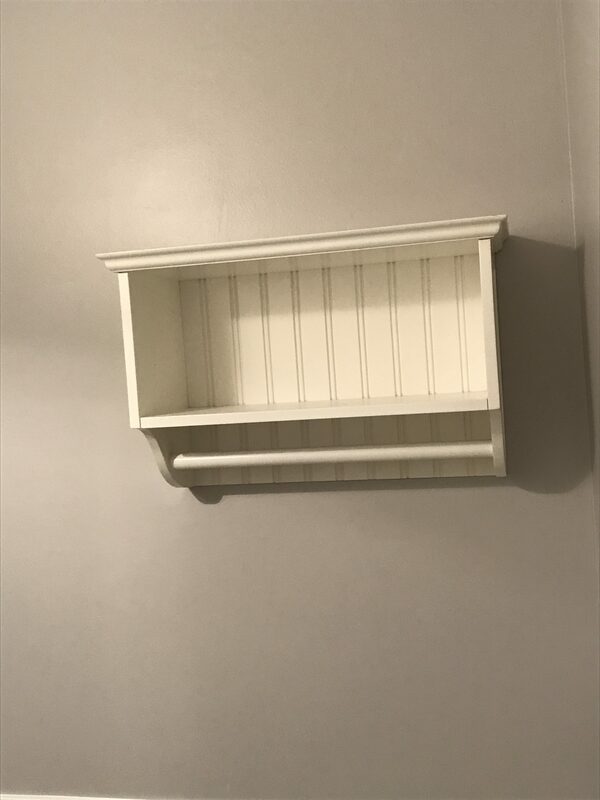 So, I had to come up with a vision for this ugly and forgotten powder room that would make a big impact for users, withstand boy abuse, and have a small footprint on our remodel budget. 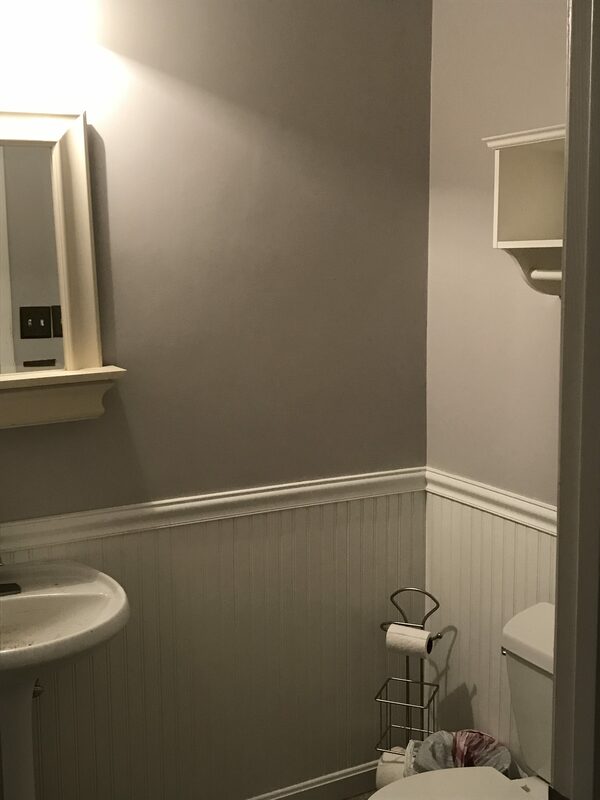 Technically, this powder room remodel was completely cosmetic with no actual renovation, so I’m hoping it will inspire you for your spaces on small budgets. As you can see, the gray walls had a purplish tint (which happens in certain lighting). 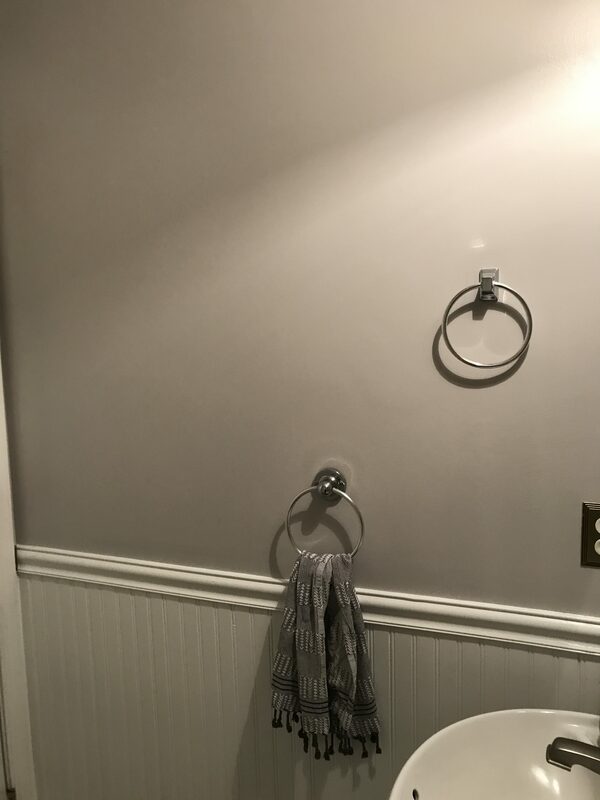 Other issues included: the shelf above the toilet- too bulky, the beadboard- outdated, the flooring- gross, the mirror- too small, the lighting- cheap, the vanity- meh, and there were 2 towel holders- why? 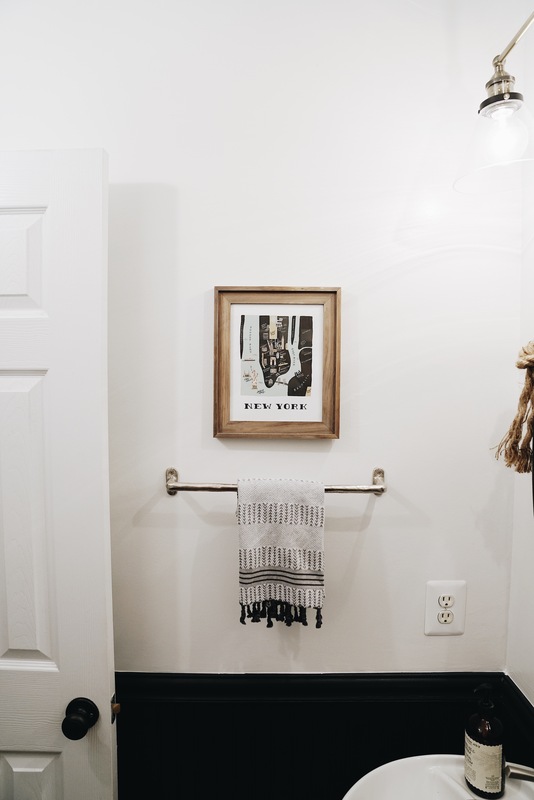 In an ideal world with overflowing design budget, I wanted to retile the floors, shiplap the beadboard, wallpaper the walls, and buy a new vanity. I did ZERO of that would-be $3,000+ expense. Yet, the economical cosmetic changes still made all the difference. Vibe: Decide on the overall vibe. 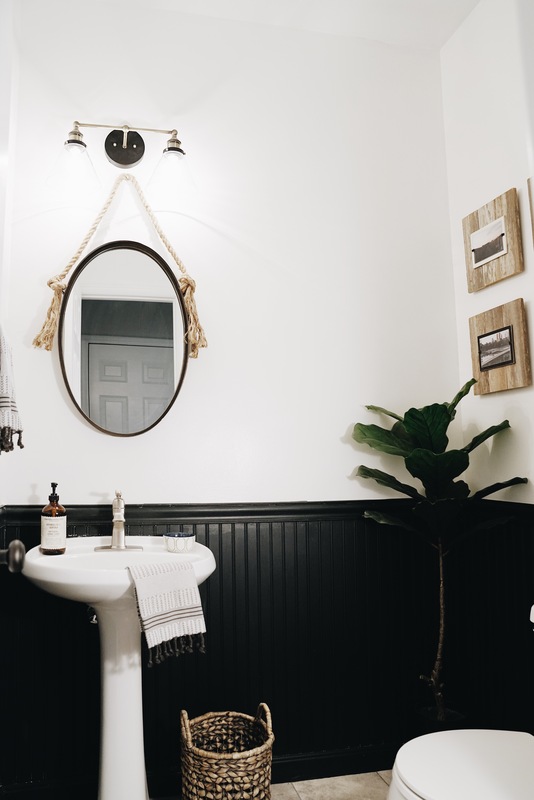 I wanted this powder room to feel a little wow and a lot unexpected, casual yet intriguing, and some old meets some new. Color: I wanted to do an unexpected color for a small, dark space. Most think you can’t go dark in small, non-lit rooms, but I like to defy that theory. Dark can be interesting and cozy. 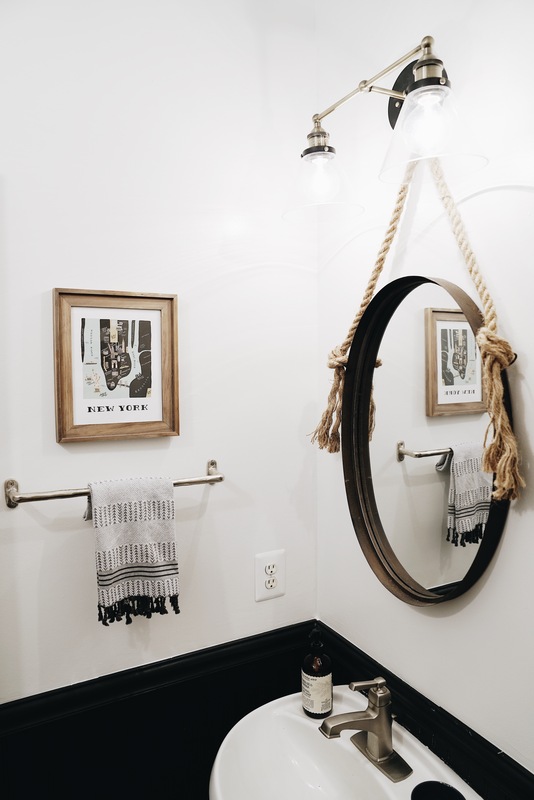 Mirror: I found a mirror on sale at Homegoods for $29.99 — the oval was the perfect shape and the rope would add some needed texture. I was worried that it might bring an unwanted nautical vibe, but I still went for it because there would be no other hints of nautical in the space. I love the way it plays off the color in the wood frames and basket. The eye jumps around the room quite nicely. Light: So, I knew i wanted clear shades for this space and found this gem on amazon for $65 (linked for an even lower price now). 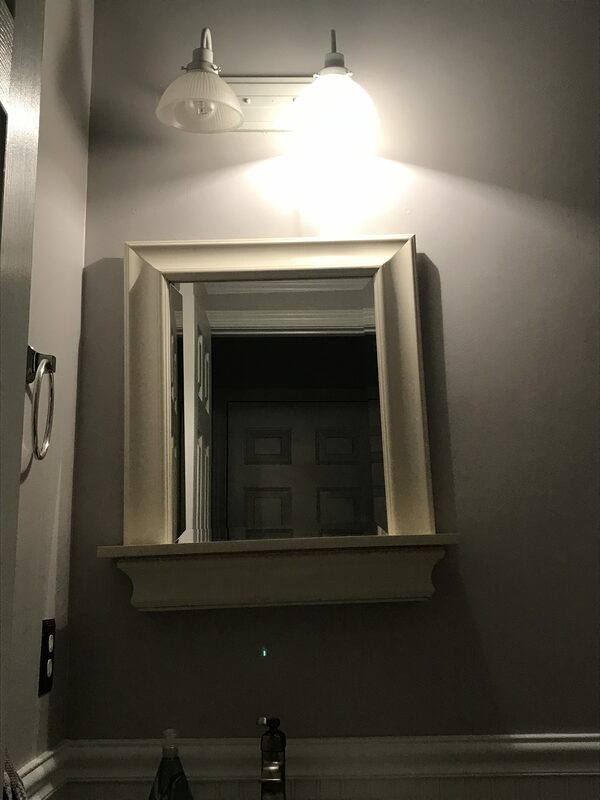 My trade discounts couldn’t find me a bathroom light for that price! Mixing Metals: I love the antique brass and black but worried that the nickel faucet would clash. I didn’t want to pay for a new faucet and it wasn’t that bad. 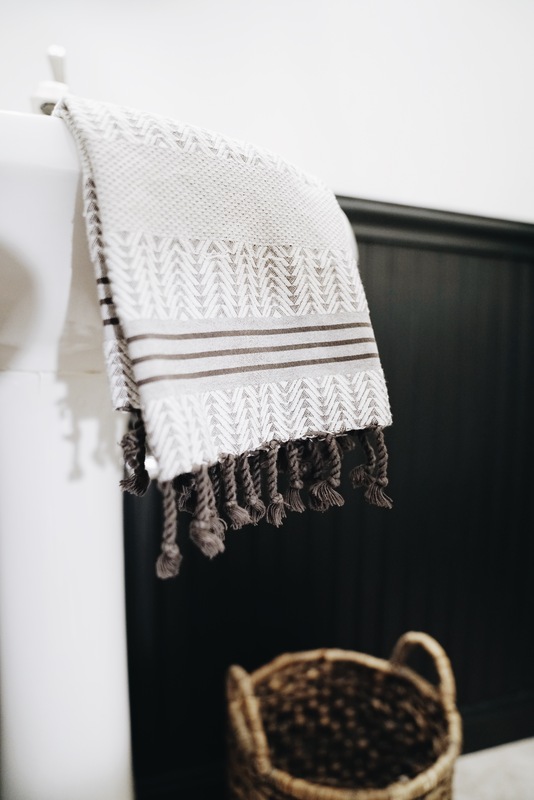 So, I brought in a towel bar I purchased from West Elm ages ago. (sidenote: I’ve kept this towel bar with me for NINE years, never finding the right bathroom to use it in until now.) It adds an organic and glamorous feel, tying in the nickel faucets but pairing with the antique brass quite well. Metals can mix. 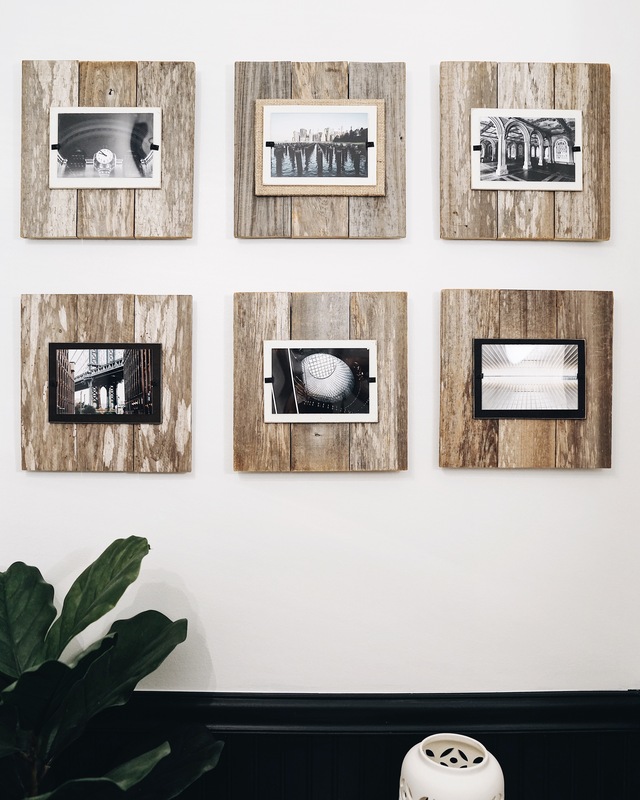 Frames: I bought these frames from a Jacksonville Beach warehouse where they made them for trade shows with One Kings Lane. They were clearance-ing them out at 75% off several years ago. Pallet wood was all the rage then, but I’m still obsessed with them. The wood adds much needed warmth and texture. Faux Fiddle Leaf Fig: I ordered this from Amazon when I was staging our previous house to sell. I made the mistake of not checking the height correctly and was not happy when it arrived. However, it works perfectly in this space where I needed some greenery and something to survive. You know what’s funny? 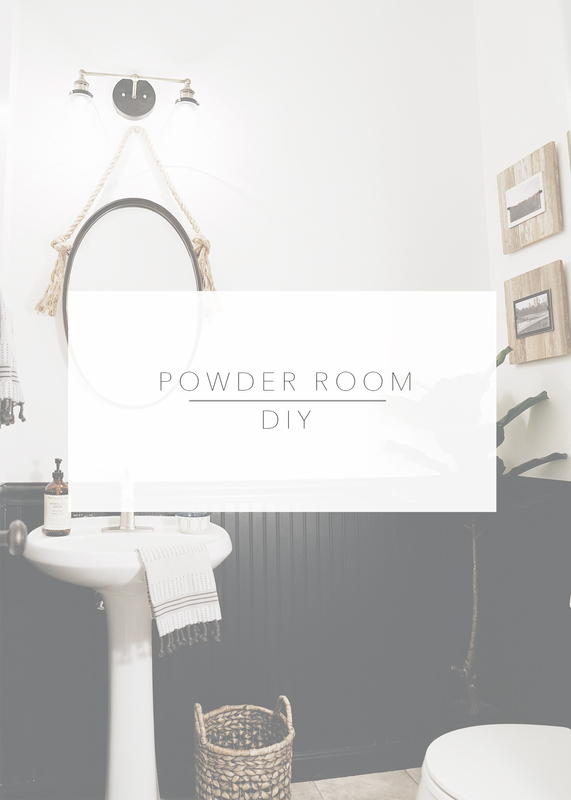 After this powder room cosmetic remodel, I don’t even mind the vanity, beadboard, or floors. It’s amazing what bold and unexpected moves can do. Good luck friends! Let me know how it goes!